Within the pages of The Story of Dikran ($15.49, paperback, 9781545618523; $7.99, e-book, 9781545620175), readers will be inspired by the miraculous true story of Dikran, an abandoned, starved and disfigured Armenian Gampr dog that was a one-third sized runt. The story of Dikran is told through the life of Benjamin, a fictitious 10-year-old boy who was adopted into a family that includes Rebecca, his 12-year-old sister, and Brenda, his mom. Ben is small for his age, does poorly in school and does not believe in God. At the end of each school year, Ben and his family go to visit his grandparents at their farm in the country. Ben loves the farm life and the biggest thrill happens every evening after supper when Grandpa tells Benjamin and Rebecca a story. This year the story will be about a dog and it will take the whole week to tell. As Dikran’s fantastic story unfolds, Ben falls in love with a dog that he is able to identify with on a deeply personal level. Ultimately, Ben must deal with his own past as well as his beliefs about God. Since 1980, David Guild had professionally trained dogs in law enforcement, the film entertainment industry and for dog owners all over Southern California. Visit his websites guardiandogministries.org and unleashthefun.com. Xulon Press, a division of Salem Media Group, is the world’s largest Christian self-publisher, with more than 12,000 titles published to date. 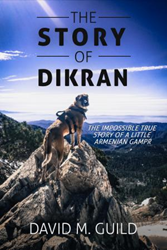 Retailers may order The Story of Dikran through Ingram Book Company and/or Spring Arbor Book Distributors. The book is available online through xulonpress.com/bookstore, amazon.com, and barnesandnoble.com.